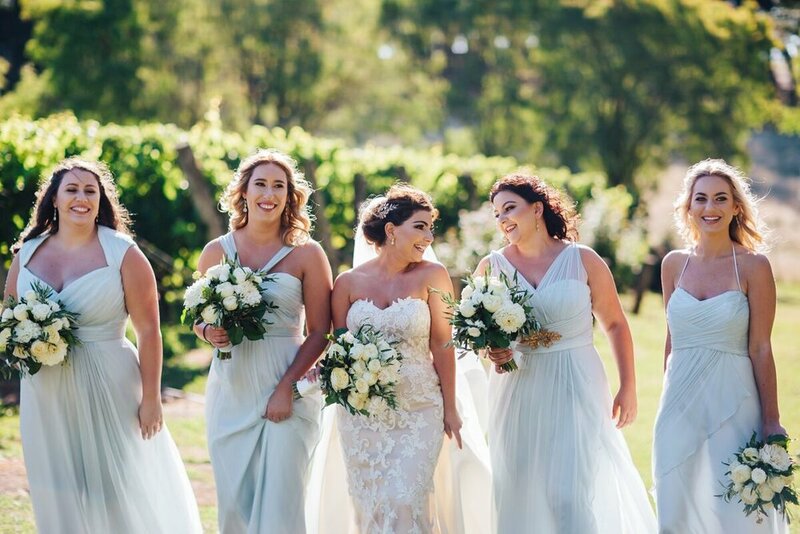 Vicky and Mohamed married in February 2018 at the gorgeous Lindenderry at Red Hill which is on the Mornington Peninsula and just one hour drive from Melbourne. This stunning wedding although classic in styling was given a fresh and modern take through heavenly white flowers, sky blue Amsale bridesmaid gowns and sharp tailoring on the men's suits. We were so pleased to help Vicky and her girls find their bridesmaid gowns and loved being a part of this dream wedding. Scroll through the galleries to see the wedding from the first kiss to last dance. The mix and match of styles gave each girl the option to wear the style that suited them best. The green backdrop is so timeless. Congratulations Vicky and Mohamed! Thank you for having us be a part of your special day. If you like reading about real weddings. Click HERE to continue reading.